Thread: Finally I found it!! 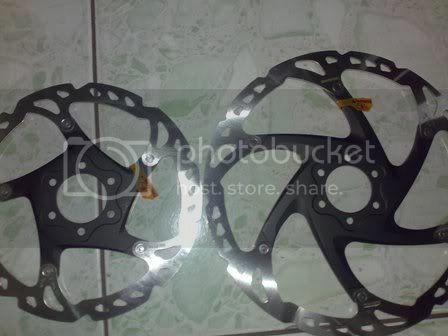 I just want to share with you guys who are looking for shimano XT 6 bolt disc.. When I change my brake to Shimano, I'll find it hard to find a good 6 bolt decent rotor.. Although my Hayes v-cut rotor works good with the calipers, but still isn't any better. But finally, my friend show up.. And offer me a great decent rotor.. It's a shimano XT rotor, with a 6 bolt.. The best thing is.. That it looks like a shimano XT or maybe XTR centerlock rotor.. The produt code is SM-RT76.. The priced deal $40 (Quite expensive for a new old disc brake).. I haven't install it yet.. But I'll give a review when it's done. Actually is my friend who found it... But I can't change the subject..
SM- RT61 should also work , about half the price . Ya, I just ordered these for my bike. They are hard to find on line and hte LBS wanted too much for them. I ended up getting them for around $40.00.